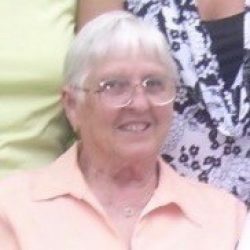 CHURCH HILL – Hallie Marie Christian, 86, passed away peacefully & surrounded by her family on November 26, 2018. Marie resided in Church Hill most of her life. She enjoyed visiting friends at the Community Clothes Closet & watching her grandsons play ball. She also enjoyed quilting, crocheting, making candy, & cooking for her large family. She was preceded in death by her parents, Charlie & Helen Seals; brothers, Bud Seals (Agnes) & Jack Seals; sister, Wanda Rogers (TJ); grandson, Steven Fields; great granddaughter, Addie Dykes; sons-in-law, Ray Johnson, Carl Hensley, & Jim McMillan; infant son, Terry Wayne; sisters-in-law, Brenda Seals & Grace Hawkins. Marie is survived by her love, Robert Christian; children, Judy McMillan of Kingsport, Jimmy Christian (Terri) of Church Hill, Connie “Sissy” Meade (Jerry) of Kingsport, & Brenda Hensley of Kingsport, Steve Christian (LaDonna) of Church Hill, & Debbie Johnson of Kingsport; grandchildren, Paige Saylor, Joey Allgood, Jamie Christian, Kelly West, Austin Fields, Jesse McMillan, Kevin McMillan, Kayla Hughes, Christian Hunley, Dr. Dylan Christian, & Megan Hunley; 17 great grandchildren, 1 great-great grandchild, brothers, GB Seals (Jo) of Church Hill, John Seals of Church Hill; sisters, Christine Robinson of Mt. Carmel, Sue Harvey (Jim) of Kingsport; sisters-in-law, Dorothy Barnett of Indiana & Sharon Seals of Rogersville. A visitation will be held from 5:00 – 7:00 PM on Tuesday, November 27, 2018 at the Johnson-Arrowood Funeral Home. Funeral service will be conducted at 7:00 PM in the funeral home chapel with Rev. Mike Torrence officiating. A graveside will be conducted at 11:00 AM on Wednesday, November 28 at Church Hill Memory Gardens. Those wishing to attend the graveside service are asked to meet at the funeral home by 10:15 to go in procession. Pallbearers will be family & friends. Gathering of friends will be at the home of Marie’s son, Jim Christian. 513 Old Union Road Church Hill. Johnson-Arrowood Funeral Home is honored to serve the Christian family.